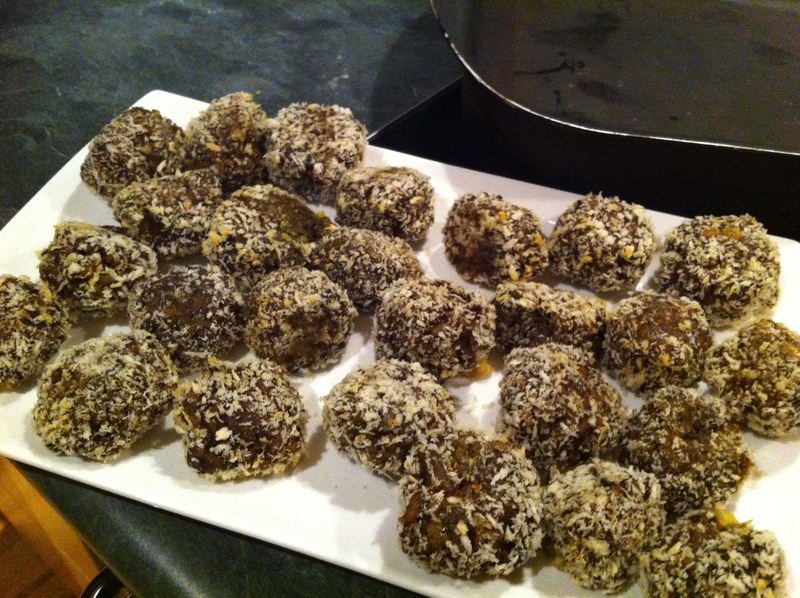 Balls – 20 minutes, plus 10 hours draining and 1 hour marinating. Pour the milk into the TM bowl and warm for 20 minutes/80 degrees/speed 2-3. Remove the lid and let the milk cool to 37 degrees, as indicated by the temperature lights. This will take around one hour. The TM bowl will turn itself off in the meantime, but it will read the temperature of the milk when switched back on. Don’t be tempted to start making the yoghurt before it’s cool enough or the yoghurt won’t set. When the milk is 37 degrees, add the yoghurt starter and mix for 10 seconds/speed 4 then heat for 20 minutes/37 degrees/speed 2 – 3. Tip the yoghurt into the Thermoserver and put on the lid. Leave the lid on for at least 5 hours, or overnight, trying not to move or agitate the container at all. Refreigerate yoghurt once it has set. Save 80 grams of yoghurt to use as a starter next time, it will last a couple of weeks in the fridge. Place a clean kitchen cloth or muslin cloth over the varoma tray and pour the yoghurt on top, leting it drain over the sink or a bowl. If you let it drain for about 5 hours, you’ll end up with thick Greek-style yoghurt. But if you let it drain for 10 hours or more, you’ll be on your way to creamy white cheese, that’s spreadable but will hold its shape. If, after 10 hours, the cheese is still too wet to hold its shape, turn it upside down and continue to drain it on a clean, dry cloth for a few more hours. Make small balls from your yoghurt. I use wet hands; Valerie uses a small melon-baller. To marinate the balls, take two bowls, both of which need to be big enough to hold all balls comfortably. Valerie adores a mixture of garlic, dried oregano and basil, fennel, caraway and dried chilli flakes; I love sumac, salt and chilli. Mix your choice of flavourings and oil in one bowl. Add balls. Tip balls gently from one bowl to another until they are well coated. Leave in the fridge to marinate for an hour or more. Drain oil before serving. Place a marinated ball on hot green beans, asparagus, a jacket potato or in a bowl of soup. 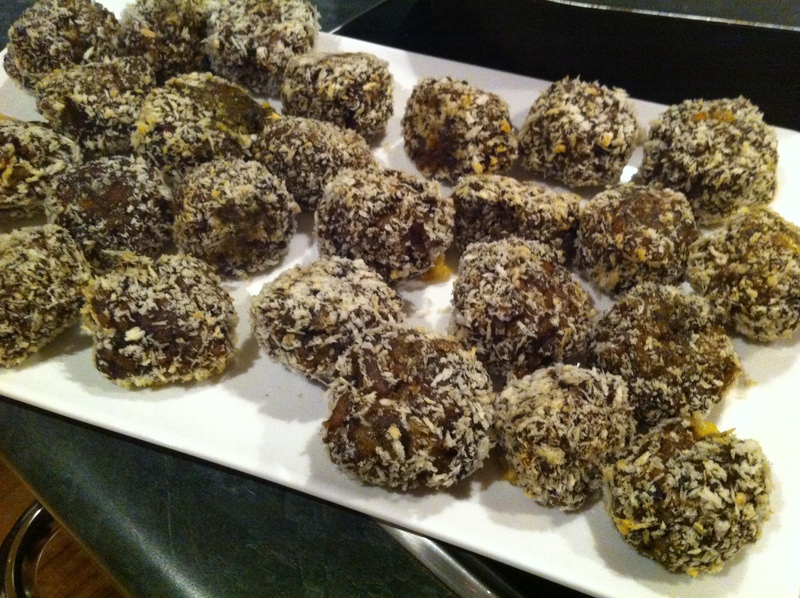 Create a sweet version by marinating the balls in honey, or fruit compote and crushed nuts. Use goat’s milk to create a homemade version of chèvre. *Yoghurt starter is a bought yoghurt that contains nothing but milk and live bacteria; organic yoghurts from small producers are a good choice. So, I settled on Yoghurt Balls. 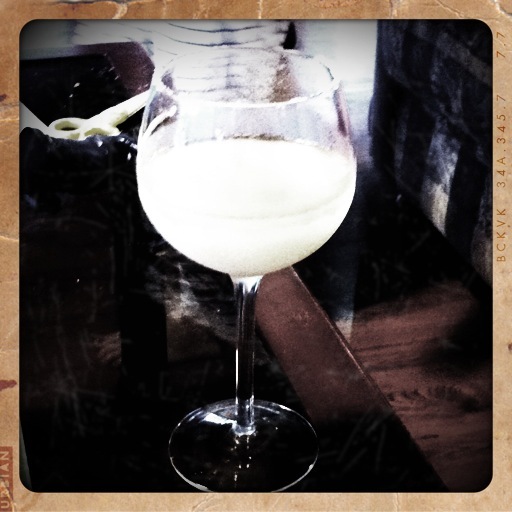 Of course, we are having Peach Margaritas as well, but you’ve already seen that post – and I think I’m going to have to go into rehab if I become any more fond of them…they really are quite addictive. I am pleased to finally report that after 3 years of Thermomixing the man of the house has finally stepped up and actually did something involving the thermomix – other than clean it! He was responsible for adding the yoghurt to the warm milk once it got to 37 degrees while I was heading out with Master 4 for a train trip. That was an experience in itself, but as I sit here typing away looking at my yoghurt setting in the thermoserver, I actually think he might have proved me wrong and not only read the directions in the recipe properly, but also mastered the scales function and how to operate the other buttons. Mind you, I did leave the lid on for him and provided explicit instructions to add the yoghurt through the MC hole. I made the yoghurt mixture in the morning, let it set during the day in the thermoserver, and set it to drain as I went to bed that night. It was the best way to do it I think – most of it’s draining time completed while I was asleep, and I created the balls the following morning and let them marinate for a few hours before we headed out. Who knew that my beautiful Nigella Lawson mixing bowls would hold the varoma tray so perfectly? I didn’t have a muslin cloth, so I used two layers of clean chux wipe, which worked really well. The tray works really well as it allows you to smooth the yoghurt out and have a bigger surface area for it to drain from. Be careful when you drain it and maybe put the whole thing in the sink as I think the chux acts like a wick and I ended up with a rather large pool of yoghurty smelling water around the bowl – as well as loads of water in the bowl. So make sure you use a large bowl. You could possibly even leave the draining yoghurt in the sink, so if it does happen, the water will go straight down the sink, and not sneak in behind your coffee maker. I had never attempted (or even been tempted) to make yoghurt in the Thermomix before. The man of the house is a yoghurt fiend, and we would easily go though 6 litres of plain yoghurt in a week – he adds berries, fruit, and all manner of things to it. I’d never really thought how expensive it was until I realised how cheap it was to make. Yoghurt will be a regular on my thermomix list from this time forward. For your starter yoghurt, Dani recommends buying a yoghurt that contains nothing more than milk and bacteria, and suggests that organic yoghurts from small producers are the best. I bought the Barambah Organic Yoghurt from my local greengrocer, and it was perfect. For the milk, well, I was a cheapskate and against my better judgement I used the $2 for 2 litre low fat milk from the supermarket. And guess what? It was fine. My yoghurt was definitely able to hold its shape the next morning, so I rolled it into balls with the aid of a melon scooper. I had loads of beautiful little spheres, so I doused them with Maldon Sea Salt and sumac, with an MC full of good olive oil. Dani recommends putting the balls in one bowl and gently tipping the balls into another bowl to make sure they all get covered with the oil, sumac and salt. I tipped from one bowl to the other, but clearly I am ham fisted and ended up with a large blob of yoghurt that didn’t look very nice at all. Undeterred, I remade the balls and this time put them on a flat dish (I used two dinner plates for the quantity I made, but next time I’d use the platter I plan on serving them on, if it’s fridge-friendly), added a little more salt and sumac, drizzled a little more olive oil over them top and hoped for the best. My only tip would be that once you’ve heated the milk and cooled it down, you pull any skin that may have formed off. The Man Of The House didn’t think of doing that, and if I had have been around, I certainly would have. I also used the varoma lid to cover the draining yoghurt. I let them marinate for a couple of hours, and before we were due to leave I packed them into a flat tupperware container. Of course, I had to have a taste test while I did that, and I decided to add some lemon zest as well, which really made a huge difference to the flavour. They were a huge hit and I’ll definitely make them again. I’ll try experimenting with different flavours as well, maybe Mexican flavours, Italian with oregano, garlic, maybe some more with lemon and salt. I’m not a huge sweet tooth, but you could also do these with honey, cinnamon, sesame seeds, or chopped nuts. Using the temperature setting means yoghurt making is a snap! The liquid that is drained off – there’s quite a lot! I did manage to get to get in quite a lot of thermomixing over the school holidays, however most of it was repeats of my In The Mix Favourites, Mojito Cheesecakes, Caramelised White Chocolate Mousse with Passionfruit Puree and Coffee Crumb, the amazing Beetroot, Pomegranate and Pistachio Salad, Kirsch Ganache and Pastilla. We were enjoying our annual holiday down at the coast – and of course my thermomix came too! What’s more though – I did manage to score quite a few thermo-related presents. The individual pudding basins I’d been wanting for the Steamed Celeriac and Mushroom Puddings, and a box full of goodies that are a little harder to find. I’m really looking forward to making some new dishes over the next little while. 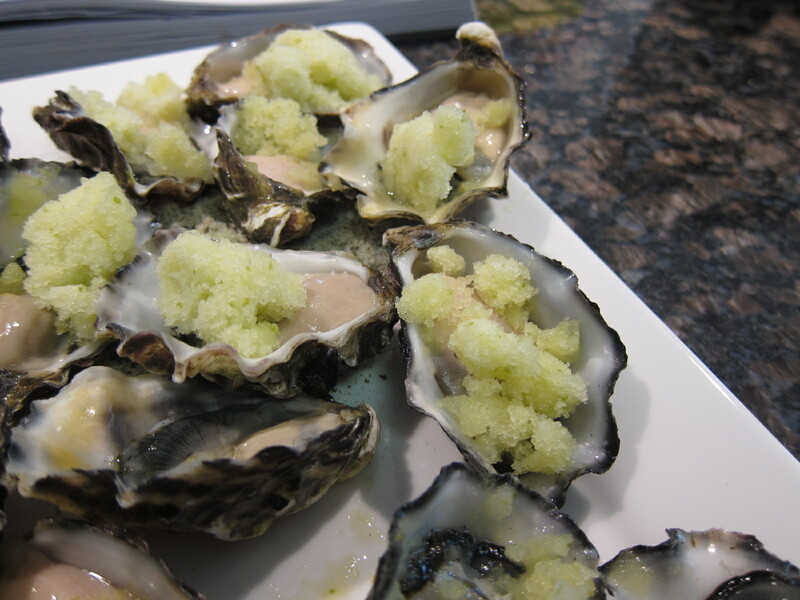 One of the new dishes I did try over Christmas was the Oysters with Yuzu Granita. I adore oysters. The man of the house doesn’t. As simple as that. Won’t go anywhere near them, hates the sight of them. 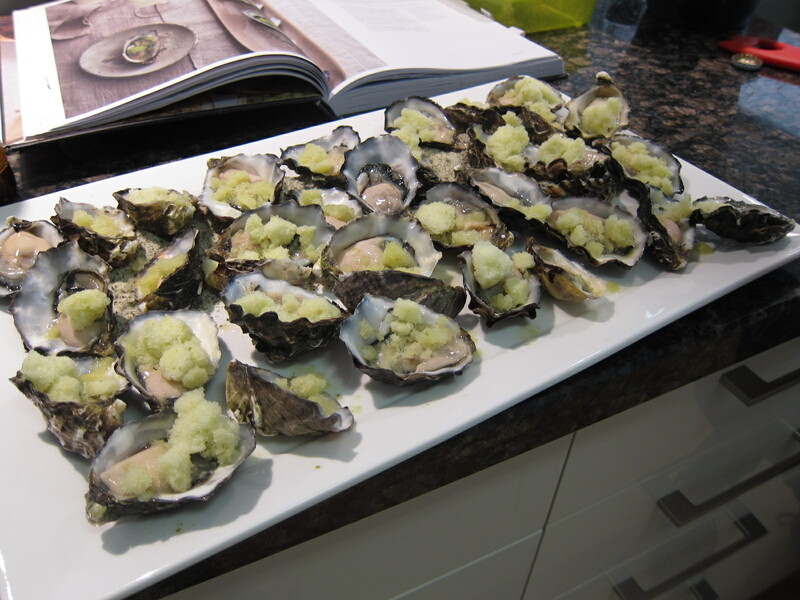 So I had to wait for an occasion where I was feeding a lot of people and what’s more, a group of people I knew liked oysters – they really are a polarising food I’ve decided. This recipe comes from Darren Robertson, who was a chef at Tetsuya’s. I was lucky enough to go there once, and it was everything I had hoped for and more. I do need another fix at some stage – but as it’s been 4 years since I’ve even been in Sydney, it might be a while coming. So, Christmas night at our house, my extended family descended. 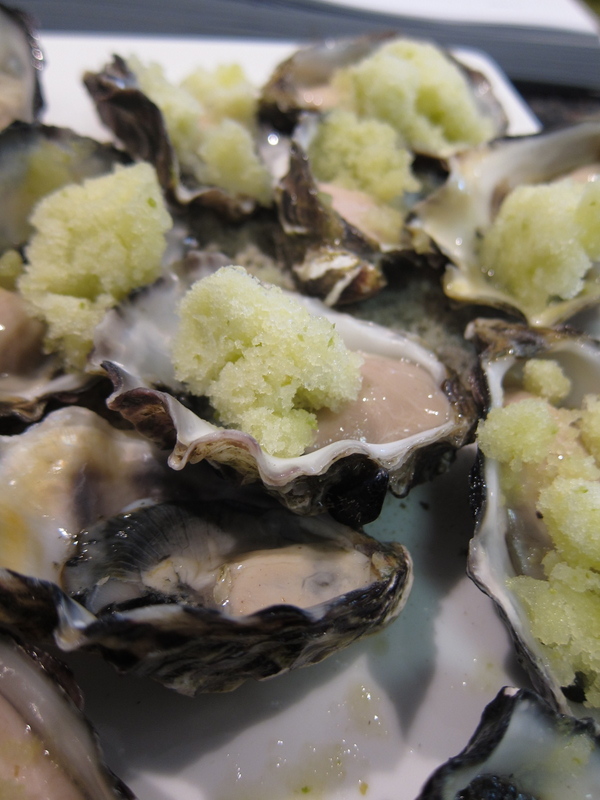 We are nearly unanimously seafood lovers, so it was a perfect opportunity to showcase the Oysters with Yuzu Granita. I did have to cheat a little, and used lime instead of yuzu. I’ve never actually seen a yuzu to my knowledge, and I wasn’t sure that the pre-Christmas day nightmare at the supermarket, greengrocer or any shopping precinct in general was the time to try and track it down. You need to make sure that you have enough time to freeze the granita mix, so I actually prepared mine the day before, so it would be completely frozen, and I wouldn’t have to even think about it until a few minutes before I needed to serve them up the next day. I was making triple quantities as I had quite a few oysters to dress – but next time I’ll probably go with the single quantity, as it made quite a bit, and unless you’re using absolutely massive oysters, I don’t think you would need it. The sand that you make to serve the oysters on is not strictly necessary – but it does help it look pretty on a serving platter. For mine, if you’re serving for a crowd and you have lots of oysters on a platter, you may not need it. I you were serving only a few oysters, then I’d definitely do the sand. When you’re serving, and this might be a result of me making the basis the day before, it was quite icy. For mine, I’d prefer it to be a big slushier, so it could be a good idea to leave it in the TM bowl for a few minutes until you reach the desired consistency. Overall though, it’s lovely. 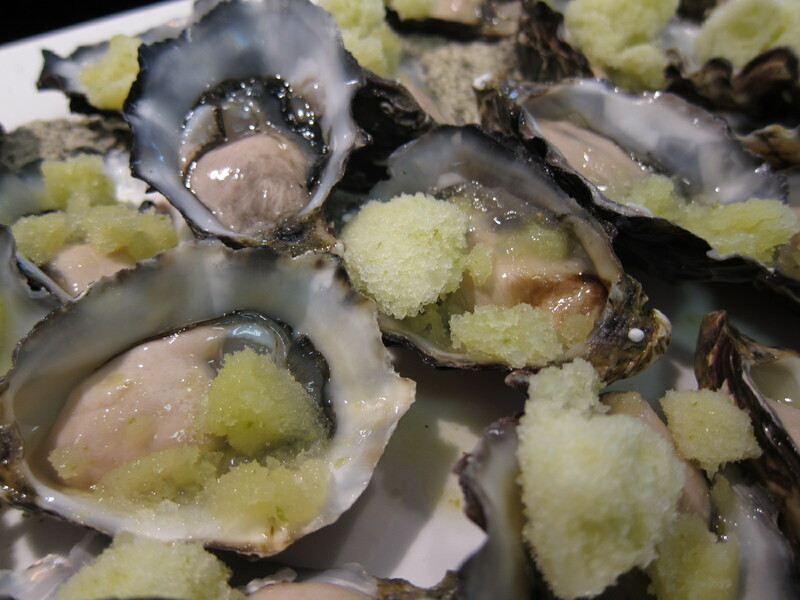 I’m even tempted to make it and serve the oysters and the granita in a shot glass. With liquor in the cupboard and a Thermomix on the kitchen bench, it’s easy to get a party started. This blended cocktail has the consistency of a granita, and the punch of a prizefighter (tone it down with extra ice, if desired). Prepare the icy base the day before or the morning of your soiree. Place the peach, rosewater and sugar in the TM bowl and reduce for 10 minutes/100 degrees/speed 2/MC Off. Blend for 30 seconds/speed 10. Pour into ice cube trays and set in the freezer. Mix the sugar, juice and water in a bowl, stirring to dissolve the sugar. Pour into ice cube trays and set in the freezer. Remove the peachy rose and sweet and sour mixes from the freezer and place the cubes in the TM Bowl. Because of the sugar content, the mixtures will be slightly soft, even when frozen, and you might need to scoop them out of the ice cube moulds. Add the tequila, triple sec and ice. Blend for 30 seconds/speed 9. Run a lemon or lime wedge around the rim of each martini glass. Tip the salt onto a plate and invert each glass, dipping the rims in the salt. Pour the margarita into the glasses and serve immediately. What says summer like a beautiful cocktail, enjoyed with friends or family, kicking back, relaxing, and forgetting all about the calories you’ve consumed in the last month? That’s right, not only is the Thermomix your best friend in the kitchen, it’s also a pretty good companion in the bar. I’d actually made the base for this beautiful cocktail in preparation for our Christmas night celebration, but we’d all started off on champagne and we thought it might be a recipe for disaster if we went to spirits from there. The good thing was as the mix was in the freezer, I just left it there, and when the mood hit me, I just had to get out the tequila and the triple sec, salt the glasses, and dig out 500 grams of ice from the freezer – easier said than done – we had relocated to the beach for the summer and didn’t have the freezer with the inbuilt ice maker. Still, I battled on valiantly and scraped up the requisite 500 grams of ice. The Peach Margarita consists of three parts – the peachy rose mix, the sweet and sour syrup and finally the alcohol and ice which you add at the end at blitz up at the very end, just as you are about to serve it. Both the peachy rose syrup and the sweet and sour syrup is frozen for several hours before you use them to make sure it’s really cold. While both the mixes don’t freeze completely, they go cold and become quite pliable. Dani recommended putting the mix in ice cube trays, but they are in fairly short supply in our house because I’ve sent them down to the beach where we need all the ice cube trays we can get – and in their absence, I just poured each of the mixes into a zip lock bag, labelled it, and froze it. It sat in the freezer quite happily for a month, so I would imagine it would keep for several months if you want to make the peachy rose mix while peaches are in season, and keep them on ice till you need a summer hit! I used the Jose Cuervo Especial tequila, and the Bardinet Triple Sec. I’m not a spirit aficionado, but they seemed to do the trick. Sadly, as we were at the beach, I didn’t have fabulous margarita glasses to make these even more special-looking. But I can assure you that it tasted incredibly summery and fabulous… and we may have downed the lot between two of us, in one night 😉 In between drinks, I stored the whole TM bowl in the fridge, and it kept the mix pretty icy cold and delicious for quite some time. I’m not sure if it was luck, the glass of water in-betweeners, the food we ate, or the magic of spirulina capsules (which one of my girlfriends swears by) that there was not a headache to be had the next morning. Want the recipe? Check the recipe tab!! Oooooh! A party! What a great excuse to make these lovely little morsels. My sister celebrated her birthday with some friends, and I decided to make the Blue Cheese Eclairs again – delicious – as well as the Mushroom Risotto Balls. I must admit, I was a little bit over mushroom risotto. Not that it’s not a great meal, and so easy in the Thermomix, but I fear I may have overdone it – I think it’s been on the menu at least once every three weeks since the day I got my Thermomix. Anyway, I relented and thought this would be a good nibble for the party, mostly because I knew there was a lot of non-Thermomix owners in the group that was invited, and my guess was that they wouldn’t be suffering Mushroom Risotto Fatigue. Oh, I’m so glad I tried this… This is a great mushroom risotto, with a really intense flavour – no doubt helped along by not only fresh mushrooms, but also a goodly portion of dried mushrooms. I bought a big container of them recently at Costco, and christened it for this recipe. The container I bought features Porcini, Shitake, Yellow Boletes and Oyster mushrooms. They tasted terrific. I can’t remember how much I paid for the container – quite a big one – 300 grams, but I’m sure it wasn’t over $20, which is pretty good value considering the price you pay for the small bags of dried porcini mushrooms. The risotto that results from this recipe is quite sticky and verges on gluggy – but you need it like this and not soupy, or the balls won’t stay together. You make little balls and put a little square of mozzarella cheese in the middle, then roll them in panko breadcrumbs. I actually made the balls the day before the party, rolled them in the breadcrumbs, and then put them in the fridge in containers until the next day and they were fine. Make sure your mozzarella cubes are in the middle of the rice mixure, otherwise you’ll have some that ooze a little cheese – like that’s the worst thing in the world!!! I oven baked the balls in the oven, but they didn’t go the lovely golden colour I would have liked. They did verge on a pale brown, but I cooked them in an unfamiliar oven so I didn’t want to risk burning them. Next time I’ll try pan frying or deep frying them and see if they look nicer. I liked the idea of being able to put them in the oven while people were there and serving them hot, rather than having to have hot oil around people who had been drinking lots – so there was method to my madness. Apologies for the terrible photography – as you can probably tell, I was a few champagnes in by the time I started to heat them up, and very nearly forgot to take a photo at all! So, yes, easy to make, and a great party nibble! I have a siphon!! It took me ages to track one down, and my usual kitchen haunts had let me down, I couldn’t find one anywhere. I googled, I internet shopped and finally I ended up at Chef’s Hat in South Melbourne, where there was only one kind left in stock. It was more expensive than I expected at $155, but I have been desperate to try out a few of these recipes that need a siphon, so I lashed out and bought it for myself for Mothers’ Day – just a little early. So, I’ve had the siphon sitting there for a few weeks staring at me asking me why I hadn’t used it. So with a few people coming over and leafing through the “Bites” section of “In The Mix”, I landed on the Mozzarella Macarons. These are a little weird in that they are not cooked – they are frozen! So it’s quite a quirky dish. The stars were aligned, because went I went to the supermarket there was only one brand of Mozzarella in water – and it was on sale. Marked down from $6.99 for 110 grams to $4.19. The use by date was only a few days away, but as I was planning to make and eat in the one day, it was perfect. I bought three containers thinking I’d need to for the 250 grams of Mozzarella, but I got 250 grams in just two containers – so I have no idea where the 110 grams on the packet came from?!? My first step was to put two trays lined with baking paper in the freezer, to get them really, really cold. Our fridge wasn’t cooperating, the freezer part wouldn’t fit the trays I had, so I had to use the beer fridge freezer. Make sure the area you are going to put the trays in is pretty level, otherwise you’ll have oddly shaped macarons. Because I’d used the leaf gelatine a few weeks ago, I knew it was gold strength – so that was one weight off my mind. I’d hate to go to all the trouble of making this recipe and then not have the macarons set! The actual making of the mixture is simple – just remember not to throw out the mozzarella water when you take the mozzarella out of the container. Once you’ve made the mix, you put it in the siphon and chill if for an hour or so. Then you have to get up the courage to use the siphon. I was an absolute novice and it seemed a bit weird to me. My first lot of macarons were very oddly shaped, and I think I wasted about half of the gas trying to siphon the mix out on an angle rather than turning the whole siphon upside down and going from there. I also tried the two different nozzles the siphon came with, and I should have stuck with the first one, the plain one. Although the cream style nozzle did make nice little star shapes, I would have preferred the traditional macaron shape. So, if you’ve never used a siphon before, turn the whole thing upside down and then press the button to dispense the mix. I also had to recharge the siphon with another canister half way through siphoning. This might have been because I didn’t have the courage to completely invert it at first! I wasn’t thinking when I thought I’d run out of mixture, and thought I had used it all up. In retrospect, it still felt quite heavy and I was happy with the number of macarons I’d made, so I took the lid off, and put it under the tap. Hmmm, I could have made about double what I did make – I just should have shaken it a little to get the mixture moving in there. You’d have to have lots of chilled trays to get everything done in one go – and enough room in your freezer to sit them all, but I left my first lot in the freezer for an hour, then peeled off the baking paper, and concertina folded the discs into layers.I reused the tray for my next lot of siphoning with a fresh sheet of baking paper. I’m wondering if doing mine in shifts a few hours apart was what made the mixture settle in the bottom of the siphon? I bet you could even make the macaron discs a few days before your event, if you were so inclined, and kept them in a container on the paper to stop ice crystals forming. Next time I make these, I’ll also double or triple the amount of tomato sugo I use. I love tomato and I think these would be even better with more of a tomato hit. I was in a flurry trying to get these plated up and served because I thought they’d start to melt, but as it turns out, I think they’re best when they’ve been able to warm up a little – say 10 or 15 minutes. They still keep their shape after that, but can be a little hard to get off the plate. If you serve them too soon you only really taste ice. I’ll make these again, as I think once you’ve got the siphoning technique down they’ll be a breeze to make – I’ll just have to buy some smaller trays so I don’t have to keep running out to the garage!